Iran’s Intelligence Ministry has shed some light on a covert operation in Somalia that recently led to the release of four Iranian fishermen held captive by pirates. 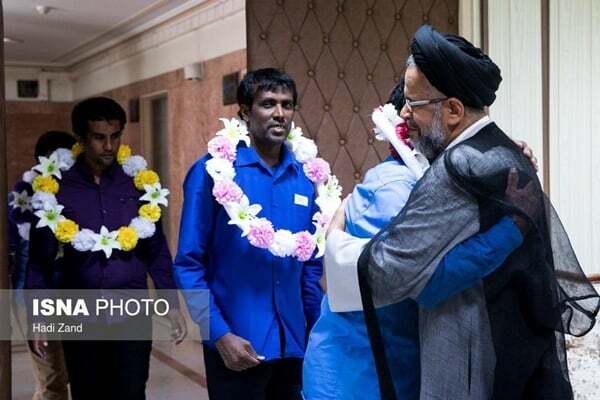 The sailors Masoud Balouchi, Ahmad Balouchi, Adam Balouchi and Shir-Mohammad Tabezar, kidnapped three years ago in international waters near Somalia, were welcomed by Alavi in Tehran on Thursday. In March 2015, two Iranian fishing ships were captured by Somali pirates who then took 21 crew members hostages and demanded a huge ransom for their freedom. On Saturday, Jame Jam daily conducted an interview with the released fishermen and an expert from the Intelligence Ministry who shed light on the complex and covert operation. Right after the fishermen were captured, the Intelligence Ministry started communicating with Somali government to help Iran have the fishermen released, but since the pirates were running through a lawless area in the African nation the attempts to free the hostages were not very successful, the expert said. However, those attempts were not totally in vain and after some months eventually four fishermen were released by the pirates, he added. Another fisherman, named Golab, then managed to escape and after days of wandering – which even saw him being jailed in Ethiopia – was finally transferred to Iran, he said. The escape, however, came at a price as the captors, angry at Golab’s breaking out, turned the conditions for the hostages into a hell, torturing and starving them to death. In the days to come eight fishermen lost their lives. Adam, whose brother was also among the captured, says two of the fishermen, including his brother, were killed as a result of tortures and six others died of starvation. Adam said that out of the eight people remaining in the captivity, four, including the ship captain were taken to an unknown place by a pirate named Karani. The Intelligence expert said the ministry started its overseas operation after attempts through diplomatic channels did not make any progress. The operation was conducted by the Intelligence Ministry in close collaboration with the Quds Force of the Islamic Revolution Guards Corps (IRGC) – the special forces in charge of overseas operations, he told the daily. The Iranian Navy has been conducting anti-piracy patrols in the Gulf of Aden – where Somali pirates have been frequently attacking ships since November 2008 – to safeguard maritime traffic, especially for the country’s ships and oil tankers. During their operations, the Iranian navy thwarted several hijacking attempts by the pirates and captured some them. The expert said a covert team from Tanzania under the command of the Iranian intelligence forces was then charged to rescue the fishermen. The team tried to reach the pirates by sea with a fishing boat. A fishing boat was used as the team did not want to raise suspicion of any operation being conducted in the area, he said. The vessel was sent to Kismayo peninsula in south-eastern Somalia, he said, but the fishing ship could not carry out its mandate as other forces – US drones – were also present in the area. The expert added that US drones were running reconnaissance operations in the area at the time because the Americans had suspected Al-Qaeda activities there. The fishing ship spent two months in the area, he added, but eventually could not reach the intended location as the intelligence team behind the operation did not want the US to become suspicious of its activities. The expert then said that the ministry had no choice but to deal the final blow by conducting the operation by land. “Finally we reached them by land and could set the hostages free,” he concluded. The expert also added that other four sailors are still at the hands of the pirates and the intelligence ministry is trying to bring them home as soon as possible.